The hybrid audio jack and XLR3 socket offers space saving opportunities in designs where jacks and XLRs may be not used simultaneously or where inadequate space is available to use separate components. 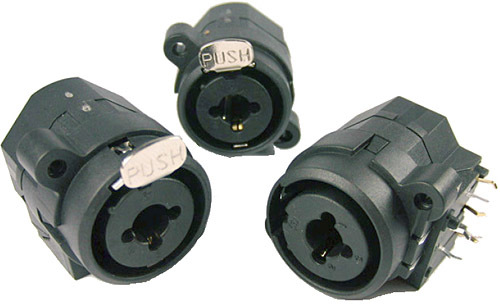 Also see our jack sockets, jack plugs, optical jacks, XLR, phono, and DIN connectors. Panel mounting by self tap screws. Optional push latch for all models. Optional grounding switch on XLR. 90° PCB without XLR ground screen: FC2410 (stereo jack unscreened) and FC2420 (stereo jack screened). 90° PCB with XLR ground screen: FC2430 (stereo jack screened). Vertical PCB without XLR ground screen: FC2440 (stereo jack unscreened) and FC2450 (stereo jack screened). Vertical PCB with XLR ground screen: FC2460 (stereo jack screened). Solder tags without XLR ground screen: FC2470 (stereo jack unscreened) and FC2480 (stereo jack screened). Solder tags with XLR ground screen: FC2490 (stereo jack screened). For push latch version add L to end of part code e.g. FC2410L. For further technical specifications please see the PDF data sheet Combi-Jack - Combined jack and XLR in one body (opens in a new window).